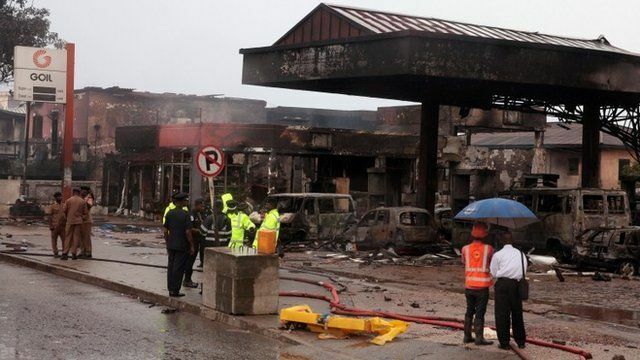 Accra petrol station blast investigated Jump to media player Residents of Accra say they smelt petrol in floodwaters which poured into their homes, and may have caused a fire which killed some 150 people. Many dead in Ghana petrol station fire Jump to media player Some 150 people die in a massive fire at a petrol station in Ghana's capital, Accra, the fire service says, as the city grapples with serious floods. Ghana fuel station inferno aftermath Jump to media player More than 90 people have died in a fire at a petrol station in Ghana's capital, Accra, the fire service says. Residents of Accra have said they smelt petrol in floodwaters which poured into their homes, and may have caused a fire which killed some 150 people. It is believed the waters carried fuel from a garage storage tank towards a nearby fire, causing a devastating explosion. Sammy Darko reports from Accra.